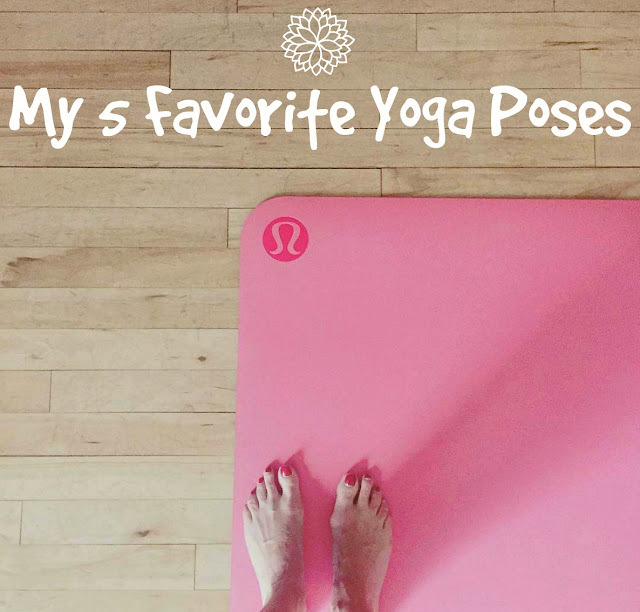 Ask anyone who practices yoga frequently if they have a favorite pose, and I'll bet they'll be able to name a few. I remember the first yoga class I took where I actually let go and truly practiced yoga. I have to be honest. It took me a few classes to really check my bags at the door. I had difficulty shutting out the outside world and focusing on myself and my mat. But once I did, I fell in love. Hard. Today I'm sharing my 5 favorite poses and why each one resonates with me. When I first started practicing yoga, pigeon pose was very uncomfortable and awkward. But as I began practicing regularly, this pose quickly became one of my favorites. If you have tight hips, this pose helps to open the hip joint. I love the way this pose fully stretches the lower half of my body from my waist to the tip of my toes. I've never enjoyed doing sit ups or crunches to strengthen and tone my abdominal muscles, but the boat pose is definitely a stretch I can get behind. In addition to toning and strengthening your abs, boat pose also strengthens your spine and improves balance and digestion. Boat pose is also effective at stimulating your kidneys, intestines, and thyroid and prostate glands. I love it for the balance challenge it provides and it's not as intense as sit ups or crunches, but you get the same results. One of the reasons I started practicing yoga was to alleviate some minor back discomfort and pain. This pose stretches the spine and shoulders to offer relief from back and neck pain as well as sciatica. This pose is also beneficial for your overall posture, which is great as we start to age and tend to lean forward. The extended side angle pose gives you a full stretch from your mid-section to the tips of your fingers, including the groin, waist, chest, lungs and shoulders. This pose will also help you perfect your balance and increase your stamina. When I first began doing this pose, I used the wall as support and to help keep me aligned as proper alignment is key to reaping the benefits of any pose in yoga. The corpse pose (or more commonly known by its Sanskrit name "Savasana") is my favorite pose. It is the final sequence of any yoga practice. The goal of savasana is to quiet the physical body and calm the brain. For each 30 minutes of yoga practiced, you should remain in the corpse pose for 5 minutes. For me, savasana is pure bliss. It's one of the only times (other than when I am sleeping), that my physical and mental entities are completely relaxed and at ease. This pose has also been instrumental in lowering my blood pressure. Child's pose is a true resting pose. Whether it's done in between long standing poses or you choose to take a rest from a pose when you feel the need, this pose is nourishing for your mind and your body. In my opinion, this is one of the most overlooked poses in yoga, primarily because it's a resting pose which is perfored to give you a chance to refresh and regain your momentum. But by itself it calms the mind, elongates the back, opens the hips, and reminds us that resting is a good thing and helps us recharge. All photos are property of POPSUGAR.